You know what always bothered me in the mainstream idea of meditation? I know that’s not how meditation is required to look — but it’s popularized as something close to that. Mainstream opinion has a specific picture of what is meditation, a model of how it has to be practiced. That’s… A lot of requirements, right? As a result, the resistance is also huge. There will always be a solid reason to not meditate. I’m sure you’re familiar with at least some of them. I was really bad at finding the time and place to meditate even for a few minutes per day. At the same time, I loved the idea of mindfulness, of being in the moment, of living life consciously. I just couldn’t find the opportunities for it. I guess I was making excuses. Half-mindfulness is better than no mindfulness. When I’m doing the stuff above, I’m only half-present. Half-drinking coffee, half-reading or browsing the web. …being human technicallymeans being 50% centaur. I drift away in random thoughts with questionable value. So what if I made myself some sort of reality anchor that would bring me back into the present moment? Can I turn these auto-pilot activities into half-meditation by anchoring myself in them? 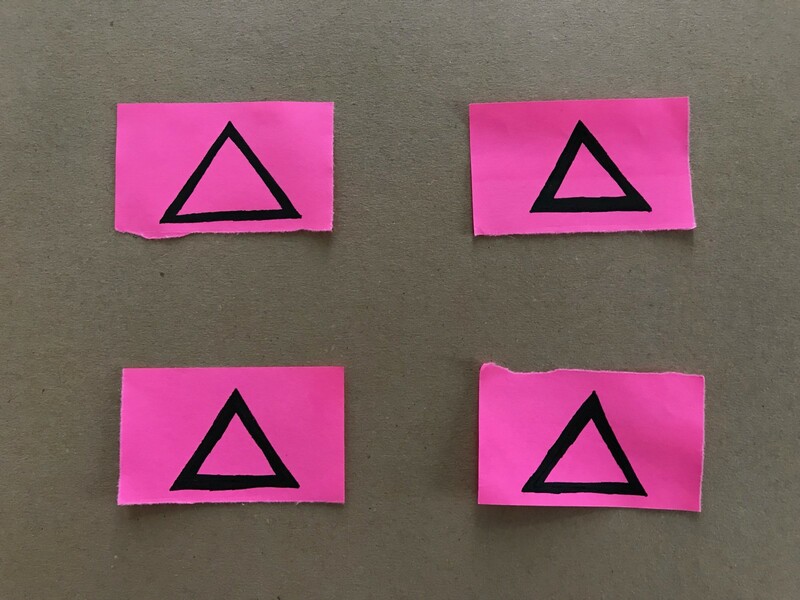 I grabbed 4 stick-it cards and drew a triangle on each of them. Then, I taped each of these papers to the surface I would most likely see during the activities on my auto-pilot list. I tried taping one of the anchors to my mug (as an anchor for when I drink coffee), but this turned to be a bit inconvenient and quite ugly, so I just left this anchor on my table. Anyway, the idea was that my wandering mind would notice these pink notes and return to the present moment. They would be my reminders to stay mindful, to be here and now. Just like an anchor keeps a ship in place. Better than I expected, actually. I can’t say I was fully present and mindful during 100% of my time in the shower or when doing the dishes—but at least I was more present than usual. I often felt grateful. For my water, food, coffee, for everything. I started drinking less coffee, often choosing water instead. I caught a few exciting ideas for future work. Although I can’t say that my experiment was the direct reason for these changes, I feel it contributed a lot. Now, the cherry on top. Before doing the auto-pilot activities that could be properly tracked (showering, eating, dishes) I started the stopwatch on my phone. 120 minutes of mindful half-meditation. Can two hours of half-meditation be counted as an hour of full-meditation? I have no idea, but I think they can. I’m not a meditation guru or an expert in mindfulness. To be honest, my knowledge and experience on these topics is basic at most. I just wanted to be more present in my own life — not wandering in some distant dreams, random thoughts, and memories with little real value. My solution was bringing myself back into those fragments of my routine that are the least mindful, using my reality anchors. So far, I like the result and plan to continue with this experiment for at least a few weeks more. Because half-mindfulness and half-meditation is better than nothing. And, funny thing, some pink stick-it notes is all that it takes.